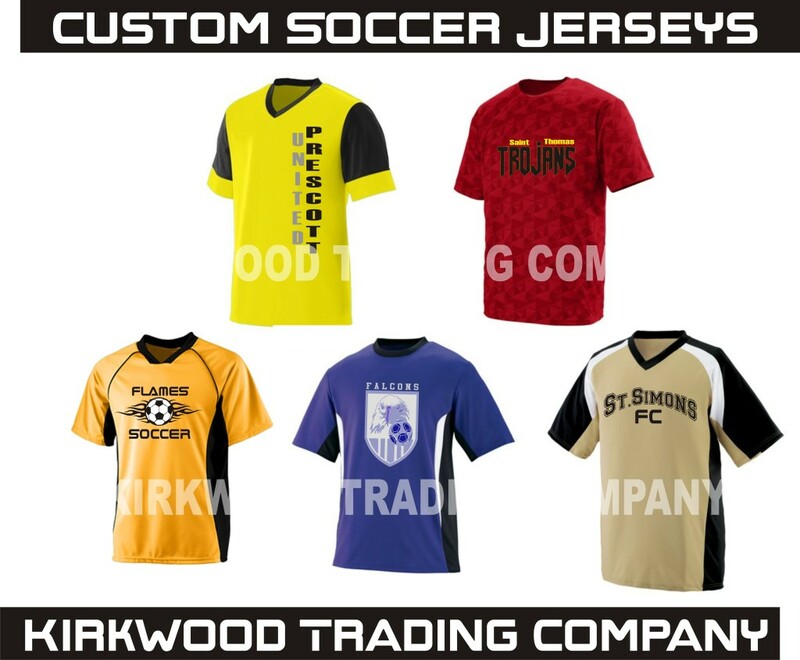 Kirkwood Trading Company offers custom printed soccer jerseys. Choose from dozens of styles and colors in both adult, women, and youth styles. Collectively we offer over 6 different brands that we can have in-house and printed in as little as 4-6 business days. In addition to printing your logo on these custom printed soccer jerseys we can also provide lettering and numbering services as well. We offer all the new modern and styles and material so that you players stay cool no matter how hot the action on the field gets. With 100% performance polyester you can relax knowing the hotter you get the cooler you will be with these jerseys moisture wicking properties. Typically we have a 12 shirt minimum order which suits a soccer team fine as they have no problem meeting that minimum requirement. On special tournaments or occasions where you don’t have 12 pieces, we can still provide you with our services but when you order custom printed soccer jerseys under 12 pieces the price goes up per shirt. In addition to providing custom printed soccer jerseys we can also be your one stop shop for the whole team. We offer shorts, socks, and bags as well. In fact the only thing we don’t offer related to soccer are the shoes and the balls. Turn around time is quick. Everything we offer is no longer than a 3 day ship to us and we typically schedule the printing the day shirts arrive or within one business day. This means you can have your jerseys in hand in 4 to 6 business days. So we are great for the last minute people and for those who plan accordingly, you’ll have your custom printed jerseys in plenty of time. Contact us at the Kirkwood Trading Company any time for questions and we’ll be happy to help.